Last year, I read and was blown away by The Court of Broken Knives and could not wait to get my hands on a copy of the sequel because I desperately needed more of Anna Smith Spark lush prose. 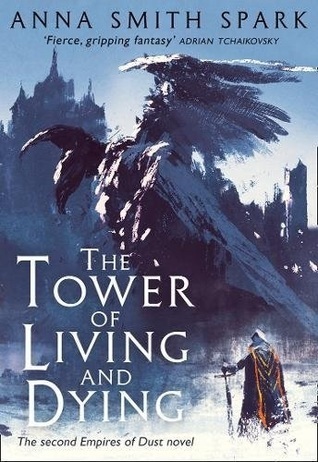 I am thrilled to say that Tower of Living and Dying completely lived up to my expectations--and then some more. There is something so engrossing about Spark's poetic, addicting writing style. Her writing never fails to make me want to just slow down and almost luxuriate in each and every word and phrase. This might make it take longer to read the book, but it's so worth it. In this second installment in the Empires of Dust trilogy, the story picks up pretty much where the previous book left off with the same general cast of characters. The plot and overall storyline felt a bit slower-paced and more like a bridge than in The Court of Broken Knives, and I really enjoyed this small difference for providing a new tone. There are still plenty of high-intensity battle scenes and other intense moments, of course, but there seemed to be a much heavier focus on the characters that I loved. This book allows readers to really get into the heads of Thalia, Tobias, Orhan, and Marith (to a lesser extent) more deeply in order to understand more of where they're at in the story and what their motivations are. I was particularly hooked on Thalia and Orhan's POVs this time around, both of which I felt had so much incredible development that I could not get enough of. I am also endlessly intrigued by the dynamic between Thalia and Marith, and I cannot wait to see how it continues to play out in the next book. There are a lot of different parts of this book that I could talk about, but I want to focus on one specific example that involves a deadly fever that overtakes a city. Now, I've read a lot of books that feature some sort of plague or terrifying illness that invades a city, but it's safe to say that Spark has written some of the most chilling, truly horrifying plague scenes that I've ever read. I literally had chills, and despite the fact that I'm a huge germaphobe myself and usually avoid these sorts of things, I simply couldn't look away. Spark just has a way of completely drawing the reader in and making them feel exactly what is happening. I could feel the terror of people trapped in the city during the plague, I could feel the excitement and intensity of Marith's battle scenes, and I could feel the pain and despair that so many characters felt at different times. Spark's books aren't just entertainment, they're an experience. As mentioned, the main perspectives that we follow are Thalia, Marith, Orhan, and Tobias, along with one other minor character's that I really enjoyed. In this book, we still get to experience some time in the city of Sorlost, but we also get to explore so much of the world outside of Sorlost as Marith travels around on his attempts to basically take over the world. I liked how Spark split up the book into various parts that mainly seemed to be based upon general location of the characters. This really made the book feel exceptionally cohesive and clear to me, which in turn made for a wonderful reading experience. Another thing that I loved about this book was how much more background and history we are able to learn about a few of the characters. Marith, in particular, had a lot of background and family history revealed that was so captivating and helped me to better understand him as a character. I also appreciated being able to learn more about the world and various cities and peoples, which seemed like something that happened fairly often in this book. And did I mention that there are more dragons? I made a pretty big deal about dragons in my review for the first book, so seeing another dragon in this book made me so happy. As always, there was still plenty of death, blood, killing, and violence in general to really cement this book in its beautiful grimdark shine. I'm not sure I've ever read any books where an author can make killing sound quite as beautiful and exciting as Spark makes it sound in her books, and for that I will always be completely enchanted with it. Her characters are all rather grey as far as morals go (okay, so some might be really, really dark grey), so while reading I would occasionally sit back and think, 'wait, why am I rooting for this person?' -- but then I read more of Spark's captivating writing and am swept back into the multi-faceted and deeply complex motivations and thoughts of each character and can't help but want to know more about them. So this review has been a bit all over the place, but the bottom line here is that I loved the second book just as much as the first, and I'm just so glad I've had a chance to read these books. This is probably obvious, but overall I've given The Tower of Living and Dying five stars! Now what a I to do until the third book comes out?